Travis Novitsky took this picture from Grand Portage, MN. "My girlfriend and I were just settling in to watch a movie when the auroras made a surprise appearance," he says. "A quick look out the back door of my house revealed that, yes indeed, the lights were out! For the next hour and a half we were treated to a green glow peppered with dancing curtains of green, purple and red." In Nebraska--yes, Nebraska--"I saw auroras on and off for approximately 2 hours from around 9pm to 11pm local time," reports Chris Allington of Crofton, NE. "There was a brief spell where color was visible to the eye with rays and bands." Allington stitched together a series of 20s exposures to create this movie. 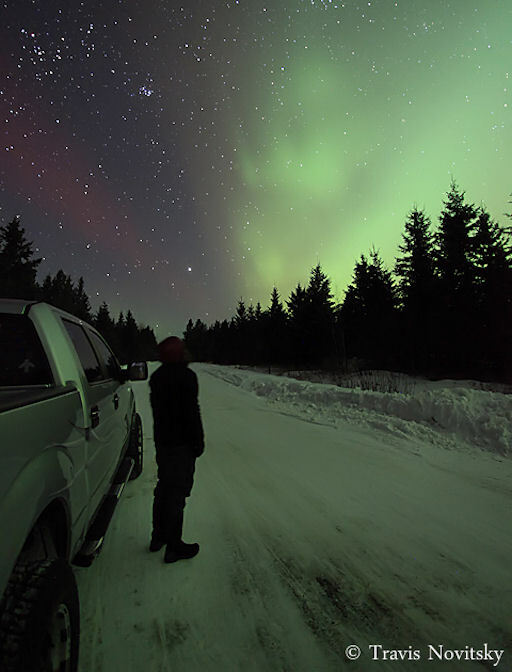 At the height of the display, researchers at the Poker Flats Research Range outside of Fairbanks, Alaska, launched a suborbital rocket to investigate how auroras affect GPS systems. Several photographers in the area caught the rocket flying into the Northern Lights. This episode might have been amplified by the action of a co-rotating interaction region or "CIR." CIRs are transition zones between fast and slow solar wind streams. Solar wind plasma piles up in these regions, producing density gradients and shock waves that do a good job of sparking auroras. Local solar wind data suggest that Earth moved through a CIR around 1500 UT on Feb. 18th. Aurora alerts: text, voice. 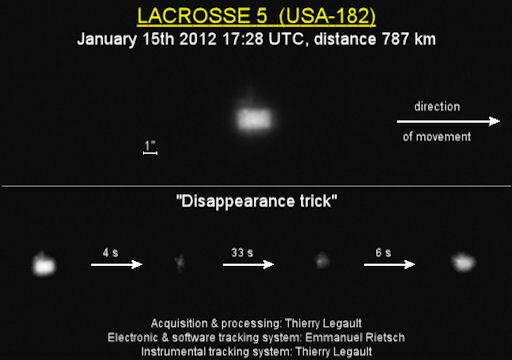 SPY-SAT DISAPPEARING TRICK: US spy satellite Lacrosse 5 occasionally confounds observers by disapppearing: In a matter of seconds, it can fade more than three astronomical magnitudes. Is this a deliberate form of stealth? Most experts think not, but no one outside of classified circles knows for sure what is going on. "During the passage, the brightness of the satellite decreased by 10 times in only 4 seconds (a loss of 2.5 magnitudes)," describes Legault. "After 33 seconds of [dark flight] it regained its original brightness. Lacrosse 5 often shows this very singular behaviour, which is called by other observers (especially Marco Langbroek) the 'disappearing trick.'" Other Lacrosse satellites do not perform the same trick, at least not to this extent, suggesting that the design of Lacrosse 5 differs from its predecessors. The fade is likely caused by some sort of self-shadowing--e.g., maybe some part of the spacecraft such as its solar panels casts a shadow over the main body when the spysat changes attitude. Even Legault's fine images do not reveal the answer. "The cause of the disappearing trick, as well as the precise shape of the satellite, remain unknown." Readers, would you like to try catching the tricks of Lacrosse 5? Check SpaceWeather's Simple Satellite Tracker and Flybys App for local flyby times. On February 19, 2012 there were 1287 potentially hazardous asteroids.